Last week while I was making my Crock Pot Beef Broccoli I realized I had a couple of packages of skinny boneless pork chops in the refrigerator that needed to be cooked. 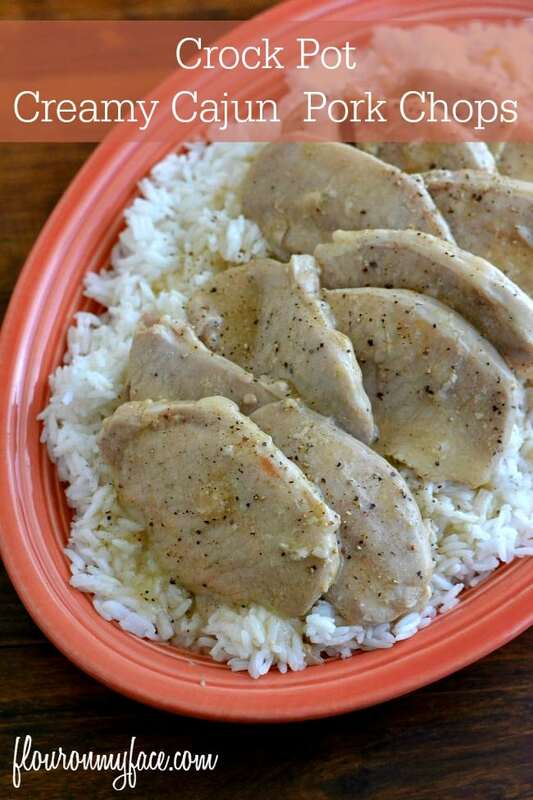 So I threw together this Crock Pot Creamy Cajun Pork Chops recipe and saved it for this weeks Crock Pot Friday. The pork chops were in danger of going into the trash if I didn’t make something with them fast. I was planning on serving the Crock Pot Beef Broccoli for dinner. Oh well, it looked like the family was going to have a choice of two dinner option. Then we could eat the leftovers for lunch the next day. It was a spur of the moment decision to make the pork chops so I didn’t have any recipe planned but what I did have was a box of Swanson Louisiana Cajun Broth in the pantry. The Louisiana Cajon Broth is a new product from Swanson. I picked it up so I could try out the Gumbo recipe on the box. I never got around to buying the ingredients for the Gumbo and that is how this Crock Pot Creamy Cajun Pork Chops recipe came to be. Place the pork chops, garlic, onions, green pepper, salt and cracked pepper in the crock pot. Pour the broth, water and corn starch in. Gently stir to incorporate the cornstarch with all the liquids. 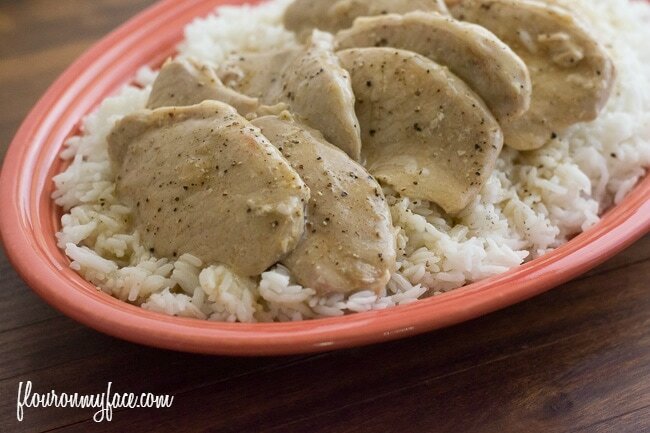 Serve pork chops on a bed of white rice. Pour gravy over before serving. I don’t think I’ve seen the Cajun broth, but these sound amazing. I will have to keep an eye out for it! I found it in Winn Dixie and have seen it in Publix here. Looks wonderful. Pinning and hoping my family will pick this recipe for one of our features soon! Thank you for sharing with us at the Brag About It Link Party! Have a great weekend! Hi Arlene, these pork chops sounds tasty and easy to make . Found your post on STH Link party. Thanks for stopping by and thank you very much!